What the heck is a Printer's Proof Card? Brooke Bond / Red Rose did not print tea cards. They had someone print them. Who? More than likely, all of it came out of a print shop in Paris, Ontario, Canada. Understand that I am not a printer and that this is my best guess. If anyone feels differently, let me know. Feedback and the sharing of ideas is what makes this hobby fun and interesting. Besides, if it seems like I'm full of hot air on this one, do all of the readers a favor and tell me what you know to be true. Before a run was started, it had to be "proofed." They would set up the presses, run a few sheets of each color through and then verify the final output. These proofs were stamped across the back with the number and name of the card, and a note, but that was all. Why not proof the back? Because the front has four colors (black, blue, yellow and red) overlapping to make myriad colors while the back is nothing more than two colors that do not overlap. Those four colors have to be perfectly aligned or the image looks blurry. An example of a proof card is shown below. The front looks just like any other card but the back is the point of interest. This image has been reduced to a thumbnail to save you time in loading the page. Click the thumbnail to see the actual full size image. Once the large one has been viewed, click "Back" on your browser to return to this page. Looking at the back of the card, you see "No. 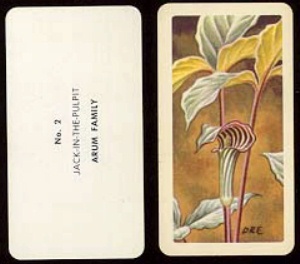 2, Jack-In-The-Pulpit, Arum Family." This is saying card number 2, the name of the card and a note about it. If you read the fully texted card it says that this flower is a member of the Arum flower family. I also have a series 3 Wildflowers proof that says "No. 17, Hepatica, Crowfoot Family." The card's full text says nothing of the Crowfoot family of flowers but an internet search quickly shows that Hepatica is indeed a member of the Crowfoot family. There is one thing to note on this card's face side. There is no National Wildlife Federation copyright. Some proof cards have them and some do not. 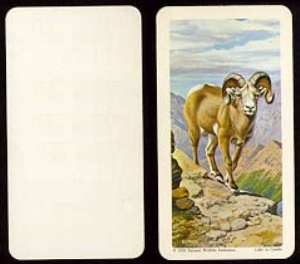 To illustrate the NWF copyright, look at the next pair of cards. 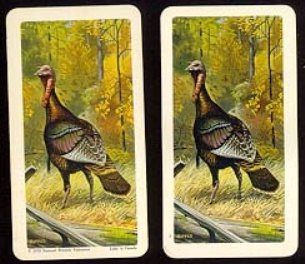 The Turkey on the left has the copyright at the bottom of the card and the other does not. Another way cards can be found is with a blank back. They also come with or without the NWF copyright. These blank backed cards are probably not proofs, but might have been run for the enjoyment of the printer. Some of the proof cards have other special markings. The card below says "24. 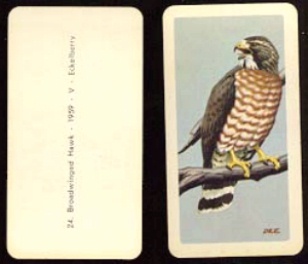 Broad-Winged Hawk - 1959 - V - Eickleberry " The cards were issued in 1962 but this card was copyrighted 1959. Eickleberry is the artist. The "V"... I did not know but a good friend has a pretty good idea of what it means. He has a series 4 proof card but his says "H". After looking at my card's image and his own, he believes the "V" stands for Vertical and the "H" for Horizontal. It appears the letters state the orientation. I say, "Good job!" and a tip of the hat to Terry Calleyne of South Limerick, Ireland. He also points out the Series 3 that I have happens to be a member of a set that is entirely vertical. Why bother to mark a series 3 when they are all oriented the same. Another "Bravo!" This man knows his cards! Does the "V" have a Special Meaning? Did Terry Calleyne solve the mystery? The only other variation I know of are the square cornered proofs. That just means they were cut with a knife or scissors instead of the usual die that the cards are cut with. I used to think this is true of any square cornered Red Rose cards you run into. I always believed they were cut straight instead of with the die. Recently I ran into a collector who bought some square cards from a woman who claims to have pulled them out of the box herself. He even gave me her name and phone number. Maybe I should call her myself. I suppose it is always possible the production cutting die broke and they used a square one in a pinch. They have always been available in small quantities so either way they are hard to come by. I discuss square cornered cards in more detail on the page called Red Rose Tea Card Errors. Check it out. These printers proofs were probably kept in a special place and used to compare to the current runs that they were producing. In any event, these cards could only have come from the printer, not from Red Rose. Another printer specialty is a complete and uncut sheet / set of 48 cards. In my personal collection, I have a set of trees uncut and a set of series 15 re-issue the same way. What do you have for uncut sheets?